Need For Speed: Payback Release Date Set For November 2017 | Nerd Much? EA has announced their new addition to the Need for Speed franchise as Need for Speed: Payback, to release November 10, 2017. The date comes with a trailer as well, which shows a small glimpse of the game’s plot and some of the cars that will be available. More emphasis is put on customization, and less on crossing the finish line first. You can apparently spend hours just fine tuning your car to the best it can be. 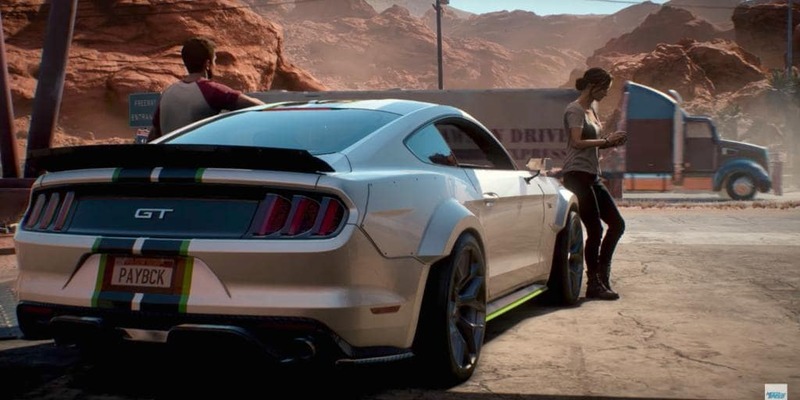 The newly expanded roster of cars, races, and open world make Payback, according to executive producer Marcus Nilsson, a “blockbuster” experience for all players. Payback is set in Fortune Valley, where you will be able to play as three different characters. Each quest requiring a unique set of skills belonging to Tyler (the Racer), Mac (the Showman), and Jess (the Wheelman). Throughout the game, these characters strive to earn the respect of Fortune Valley’s underground members. If you’re not really into the story, the upside is that you can bet on yourself and multiply your winnings as much as you’re willing to risk. Pre-orders are also available now and come with a variety of packs, including the platinum car pack which gives you “five uniquely customized and tuned” cars at launch, each with the platinum blue tire smoke. These cars are a Nissan 350Z 2008, Chevrolet Camaro SS 1967, Dodge Charger R/T 1969, Ford F-150 Raptor 2016, and Volkswagen Golf GTI Clubsport 2016. If the platinum pack is not enough for you, the deluxe edition is available as well. This will get you access to the game three days early, exclusive customization items like a license plate, NOS color, in-game discounts, rep bonuses, and the platinum car pack. If pre-ordering isn’t your thing, you can access the game early through EA Access and Origin Access Play First Trial. The first 10 hours of the game will be available November 2nd for these members, in addition to a 10% discount for the digital version of the game. The full Need for Speed: Payback game will be available November 10, 2017 for everyone else, on the PS4, Xbox One, and PC.